100% Brand new and good quality artificial wool carpet, a great addition to your home. 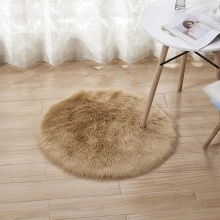 The rug is super soft and comfortable, which provides a nice soft feel to your feet. It can be used in the living room, bedroom, children&apos;s room, etc. Made of fine faux wool material, safe and skin-friendly. Long plush, super soft and comfortable, warm and breathable, providing great comfort for your bare feet. Anti-slip bottom design prevents you from slipping when you stand on it. Suitable for living room, dinning room, bedroom, children&apos;s room and so on. Machine washable, easy to clean and maintain. Simple and modern style, fine workmanship, a great decoration for your home.